There’s a lot to tell you about what’s going on, but first, a quick side trip to Melbourne on the final leg of my Australian adventure, where I went to see David and Ollie. Ollie is the daughter of good friends, and she calls me one of her “fairy godmothers.” David is her significant other. The two of them are studying like mad for their law degrees, but downed books long enough to make me very welcome. Melbourne felt a bit like Montreal, and although it’s the most temperate of the cities I visited, it was baking hot while I was there—around 38 degrees Celsius and super-humid. 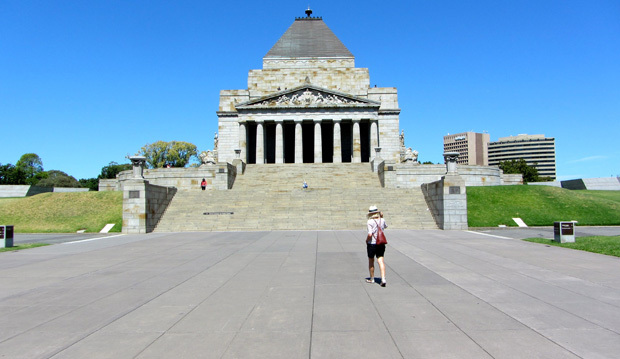 Panting and mopping my brow, I crept up the stairs of the Shrine of Remembrance, an imposing monument to Australia’s war dead. 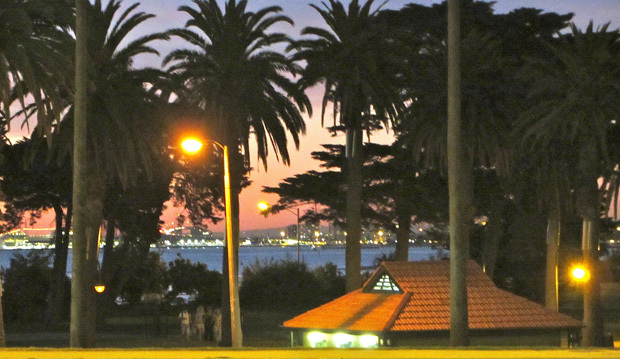 The shrine was enroute to the Royal Botanic Garden, Melbourne , which of course was top of my must-see list. 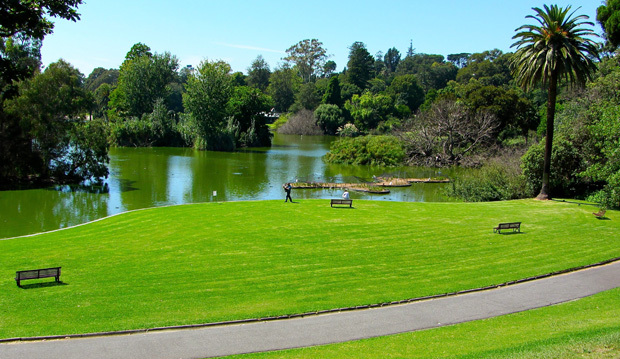 This is another long-established garden (1846) with handsome old trees, rolling lawns, and even a lake—a welcome sight on an incredibly hot day. 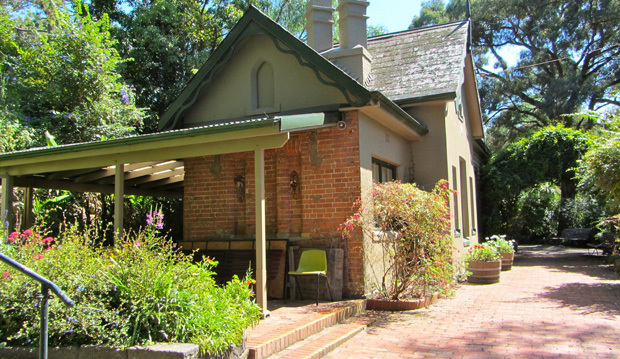 It’s replete with quaint Victorian touches, such as the Plant Craft Cottage, a listed building, where interested participants practice time-honoured crafts using natural materials. But it’s not all raise-your-pinky and have a cup of tea. There are strong modern elements as well. Take this water-wise planting on the side of “Guilfoyle’s Volcano”—a feature that was covered up for 50 years but recently restored thanks to private support. 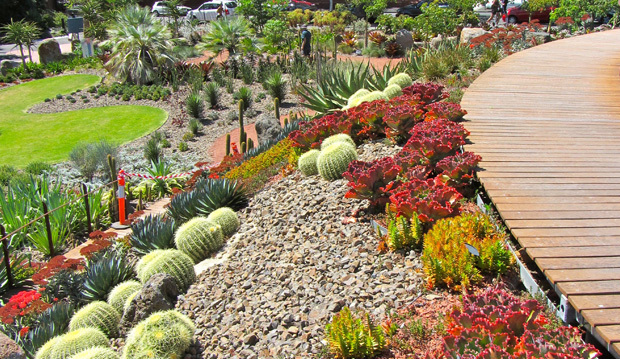 It’s filled with 17,000 plants that include 250 different species and 97 Australian natives. 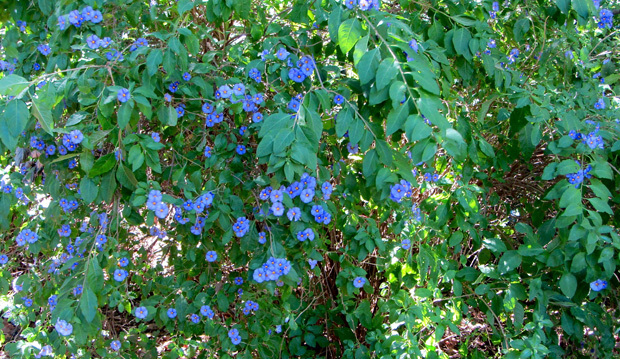 Two-thirds of the plants were propagated in the Gardens’own nursery. 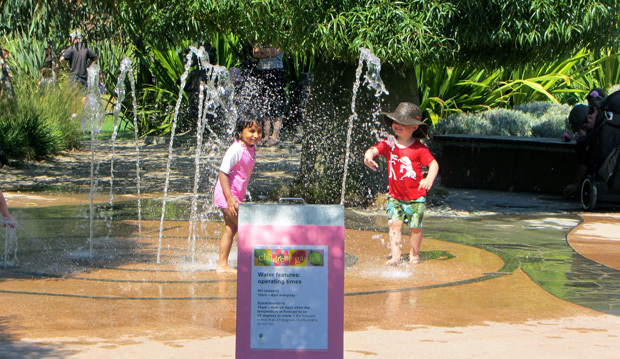 Of special interest to me was the Ian Potter Foundation Children’s Garden. 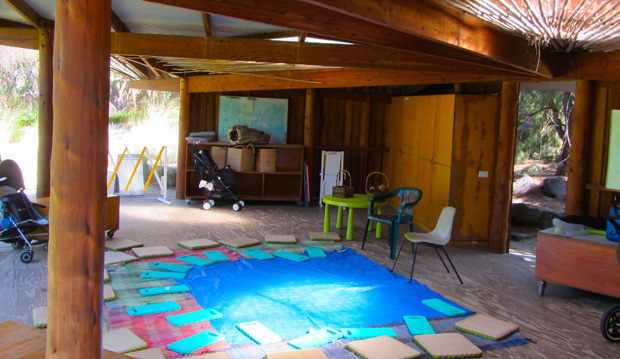 Many of you know that a TBG children’s garden is a distinct gleam in our collective eye. Watching the children enjoy this one made me want to get right in there with them—or maybe it was just a touch of sunstroke. And it had a lovely covered outdoor space, too. I popped in this photo to torment our education team. On my last night in Melbourne, and Australia, Ollie and I strolled along the edge of the waterfront and went for a lovely farewell dinner. 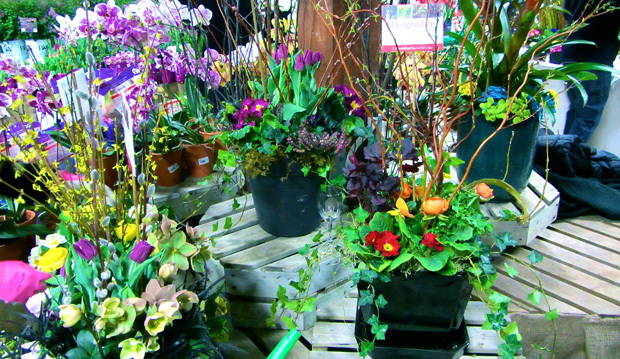 Then it was home again, home again jiggety-jig–and the first week of my latest floral design class. 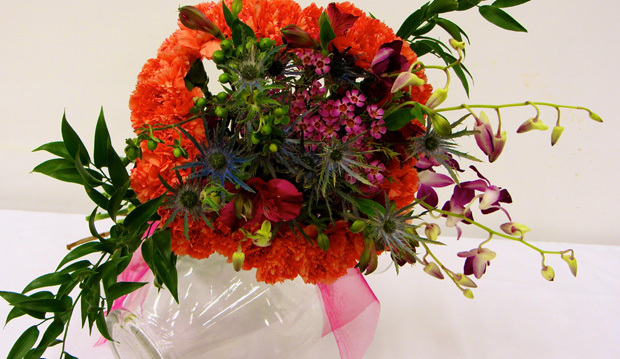 “Special Occasion Florals” is taught by the irrepressible Margaret Taylor. 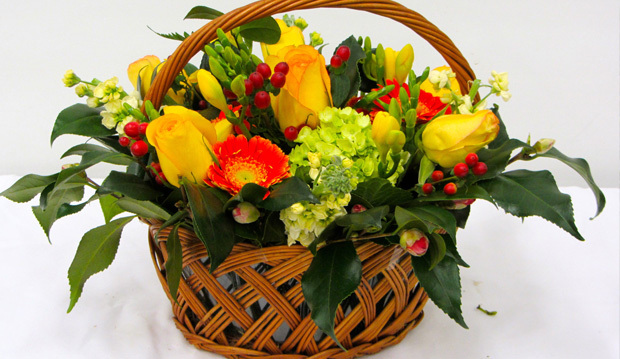 Our assignment was to create an arrangement in a basket, which is a perfect, no-fuss vessel for a hostess gift, centerpiece or get-well gift because it’s so easy to carry. Putting this baby together was a lot of fun, and mine stayed fresh for a full ten days. My second effort was less successful. Carnation calyxes were carefully strung together on thin aluminum wire which was then bent to make a modern architectural shape, and their stems were gathered and twisted in a hand-tied bouquet. The rest was meant to be filled in with other flowers, leaves and berries. However, my colour choices and flowers were limited by a less-than-stellar selection in a local shop, and were none too fresh, either. The result? Messy and mediocre. So it’s a good thing Sheridan Nurseries hadn’t seen that design, or they might have thought twice about inviting me to participate in a celebrity container planting session for charity to mark the reopening of their newly renovated store on Yonge Street near Lawrence (wow, what an improvement!). 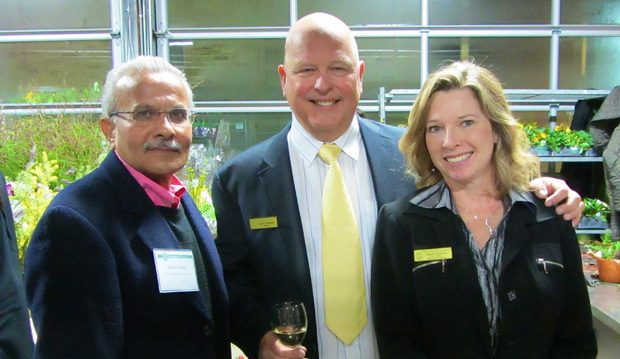 Here, store manager Amin Datoo (left) chats with Karl Stensson, president of Sheridan Nurseries, and Valerie Stensson, Sheridan’s Vice President, Marketing and Purchasing. A couple of the containers that were created for the silent auction (mine’s the one in the right foreground). Along with others, my pals Charlie Dobbin and Sonia Day also participated, and we had great fun trying to out-do one another (how many plants can one person stuff into a container?) while sipping on wine and trawling for schnibbies. Thieves and vandals! We’ve had robbers stealing plants and seedlings from out back, and even removing plants and bulbs from the beds. We’ve had yokels tramping through plantings to create short cuts to the parking lot. Hello? Moronic behaviour like this causes more destruction than the pooping geese. Grrr. Where do I begin? 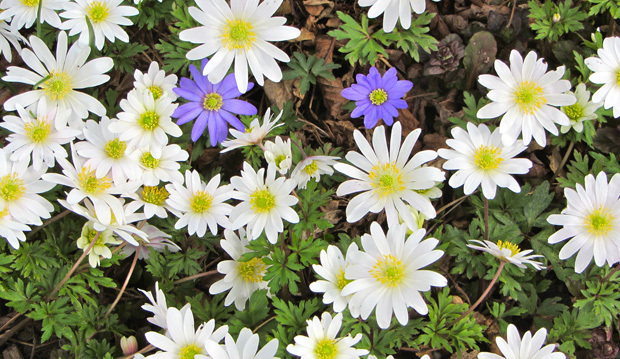 Spring in general, glorious spring. Every day I venture out to look at what’s up, what’s blooming, what’s coming into bud. 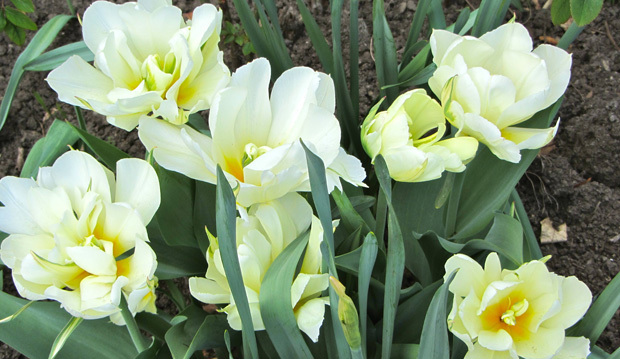 The ‘Exotic Emperor’ tulips shown here can be seen in the Floral Hall courtyard. And the hellebores throughout the gardens are at their peak. 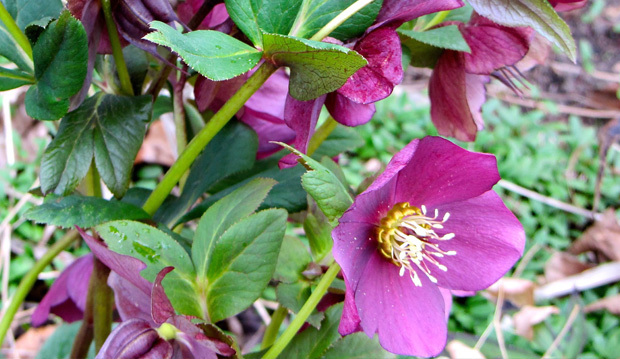 I photographed Helleborus x hybridus ‘Early Purple’ in the Westview Terrace. And don’t you just love the shy blush of chartreuse that’s touching so many trees right now? My eyes are watering—allergies, not emotion—but that lemon-lime colour is so fresh, so young, so darned…hopeful. 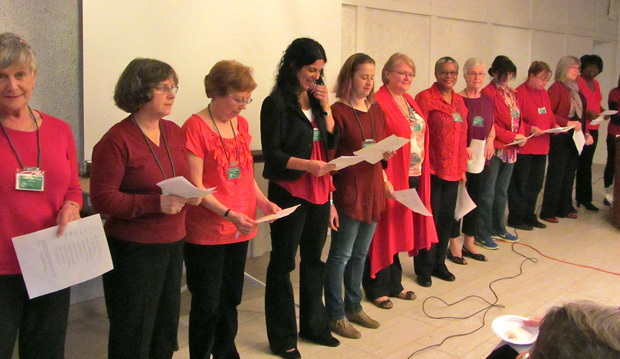 Congrats to all the newly minted Toronto Master Gardeners. I’m glad you no longer need to endure being called a “MGIT” (master-gardener-in-training). 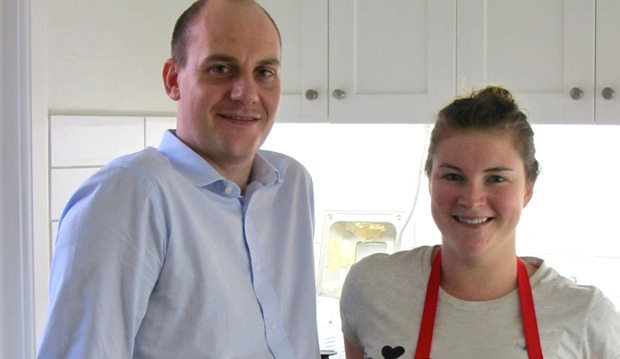 Last but never least, this is Volunteer Appreciation Week, so I offer my warmest thanks to our wonderful volunteers. You make it a pleasure to be here, to work here, to be among you every single day. Bravo, bravo, bravo for all that you do for the TBG! Aldona Satterthwaite started gardening as a child and has never stopped. Until recently, she was the executive director of Toronto Botanical Garden. Previously, Aldona was editor-in-chief of Canadian Gardening magazine, which during her eight-year tenure was twice named Magazine of the Year (large circulation category) by the Canadian Society of Magazine Editors. In 2007, she was co-named Editor of the Year. Aldona, who’s a Master Gardener, completed her journalism studies at the Regent Street Polytechnic (now Westminster University) in London, England and studied landscape architecture at Ryerson University. She’s enjoyed a varied and successful writing and editing career that has spanned magazines, advertising and the museum world, and has included stints as Director of Writing Services at The Museum of Modern Art, New York and as manager of creative services at the Art Gallery of Ontario. Scape: A leafless flower stalk. * Snowdrops (Galanthus) produce their flowers at the end of scapes. Garlic also produces scapes which are edible and delicious! *Allaby, M…. Aldona at Large: Everything All at Once, Right Now! Aldona at Large: Fabulous Festive February! Aldona at Large: People and Plants = Perfection!